30 years ago our family with 2 little children made the big move from Germany to the beautiful Island of Tasmania and we called ourselves very lucky to have found our little paradise in the heart of the Tamar Valley within a few weeks of arriving. Hardly any of our family and friends in Germany knew where Tasmania was back in those days. This has changed of course, as many of them came for a visit and could see themselves why we had chosen to live in Tasmania – because it is one of the best places in the world. We started to plant lots of different fruit trees such as Cherries, Apricots, Peaches, Plums, Prunes and various apple and pear trees. And of course, we wanted to grow our own vegetables. Also, about 20 years ago we established a Hazelnut Orchard, which covers nearly one third of the property. We haven’t used any chemical sprays or artificial fertilisers on our fruit and vegetables – as a matter of fact the whole property is spray free and everything organically grown. Since 2007 Frank has been involved in research, production and use of Biochar, and is very active in establishing the understanding of the potential use of Biochar in healthy soil development, horticulture, aquaculture and farming. There are very interesting opportunities to be explored with anyone interested in caring for the land, soil health, carbon sequestration and renewable energy from what is still considered organic ‘waste’, also called ‘unloved biomass’. 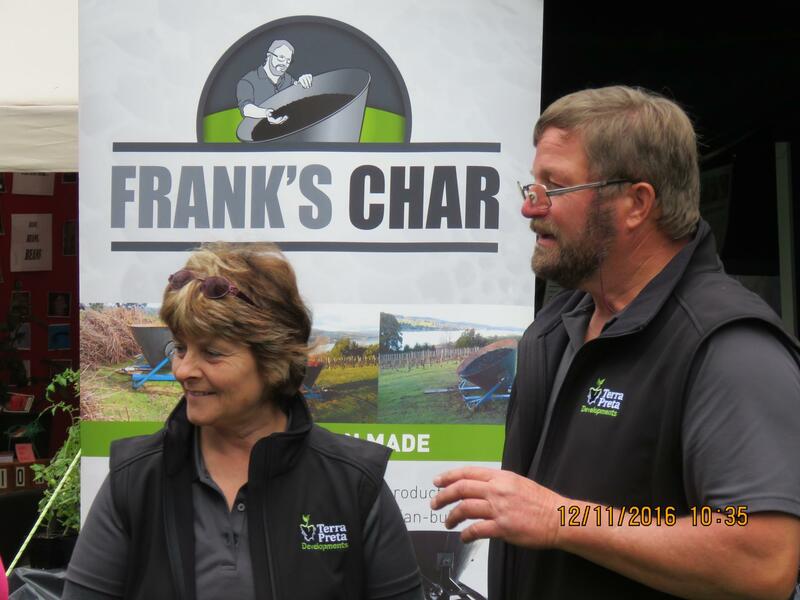 Today our Tamar Valley based business Terra-Preta Developments is exploring the potential uses of Biochar and is producing FRANK’S CHAR branded products not only for use on our own land, but have made it available through leading Garden Centres and local Markets. A Market provides the opportunity for a face to face discussion and for Frank to answer your questions and exchange ideas.